Slate roofing provides a classic visual appeal for homes and businesses in the Baltimore area, particularly those in historic districts. The rustic look of the stone shingles creates a truly unmatched aesthetic that simply can’t be mimicked with any other roofing material. Although the cost of a slate roof may be a bit more than other roofing types, sometimes you can’t put a price on achieving the perfect look for your home or business. If you believe that historic aesthetic is important, then you should turn to Roland Slate Service Company to install your new slate roof. We specialize in restoring and maintaining historic buildings, and we would like to put our expertise to good use for you. While many slate roofing contractors may only be concerned with the bottom line, we at Roland Slate Service Company believe that a great customer experience is paramount. After all, if you are paying for the cost of a slate roof, you should be entitled to great customer service. That’s why we will take time to get to know you, take accurate measurements, and properly install our products to ensure their long-lasting performance. 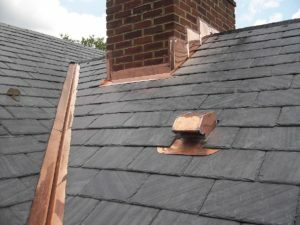 Considering the cost of a slate roof, you will want to be assured that your investment is fully protected. Roland Slate Service Company offers comprehensive labor and material warranties to give you that peace of mind you are looking for. To receive a quote for the exact cost of your new slate roof, contact Roland Slate Service Company and schedule a free, no-obligation consultation at your Baltimore area home or business.